I've taken Weekly out of the title and I'm just going to number them as and when I do them to reduce the pressure on myself. 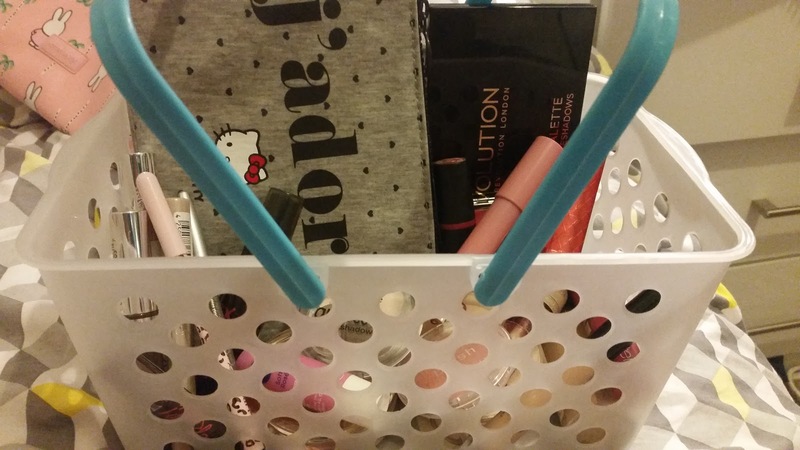 I also have a basket, it was from Poundworld But when I got home I realised I already had some baskets that I had on my shelves but this one has handles and makes me wants to play shop. I think the main thing for me is never to fill the basket and if it doesn't fit then I can't use it. Collection 2000 Fix me up Make up Fixer - I haven't really given this a chance and as it's so warm at the moment I've decided to try it. Maybelline The Eye Eraser - I don't even know if this will work colour wise but it's in my use 8 by bonfire so I'm going to give it a try. Collection Concealer - Again I don't think this will be a decent match but it's the darkest one I have. Milani Illuminating Face Powder - I got this in my recent beauty crowd hail and haven't used it. I'm hoping it will work well with my current colouring. Essence Stay All Day Powder 10 Matt Beige - Again I'm not sure if this will work well for me but I was really enjoying using it and I think it is going to be switched into the use 8 by Bonfire challenge. Essence Silky Touch Blush 20 Babydoll - I don't think I like this, NO that isn't true. I do like it I just don't use it. Which is in the reason it's in my use 8 by Bonfire. I did say in my Video I was going switch it out but I'm going to leave it in as the whole point is to challenge myself. 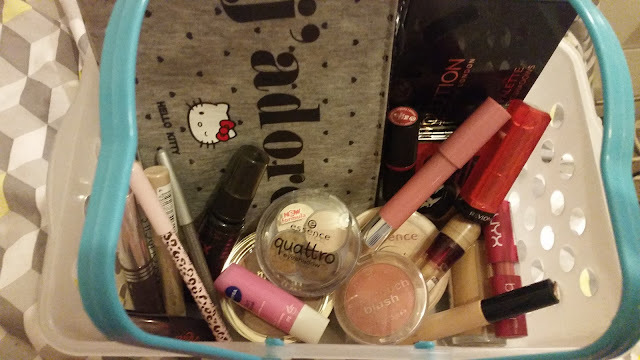 I feel like I need to quantify the number of lip products I've picked out as over the past couple of baskets I've been strict with myself. and 5 might not seem like a lot to others but now I'm home I have lots of choice I'm relishing it. I'm also hoping to be up early enough to do my make up at home before I go to work. Mirror - I got this in the Joyful June swap with another blogger. I've no idea where she got it but it's really cute and has two mirrors. Revlon Colour Burst Balm Stain 001 Honey - I use this quite a lot and I find it really easy to wear. I think it's similar to my own lip colour but better. I think I will re buy this if I ever use it up. 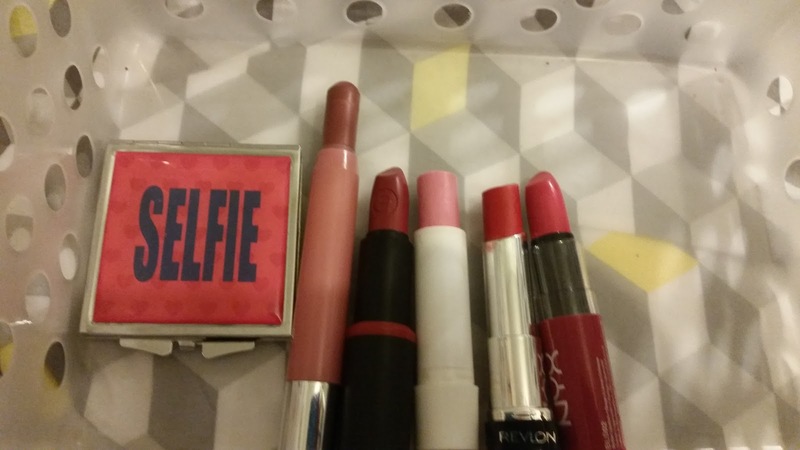 Essence Long Lasting Lipstick 04 On The Catwalk - I feel like I neglect "real" lipsticks. I feel like they are an autumn / winter product but I have lots of them and this one seems like I can layer it or wear it quite sheer. Nivea Soft Rose Lip Balm - This is going to be a constant as it's part of my use 8 by bonfire night. I haven't got bored of it yet. NXY Butter Lipstick Sweet Tart - I was so excited to get this and I really don't think it suits me, I've seen so many people wear this and it always looks amazing but I feel like it's too pink and when I try and put it on really sheer I get it all over my face. Essence Quattro Eyeshadow 05 To Die For - I'm a great one for getting eye shadow quads and never using them as my pallet with a mirror is generally easier but I'm really impressed with the pigmentation and I used it this morning and remembered how much I enjoy using this. Eyebrows - This has disappeared out my make up bag since I packed all this stuff up last night. It's an eyebrow conditioning treatment that you us to encourage growth where you want it. 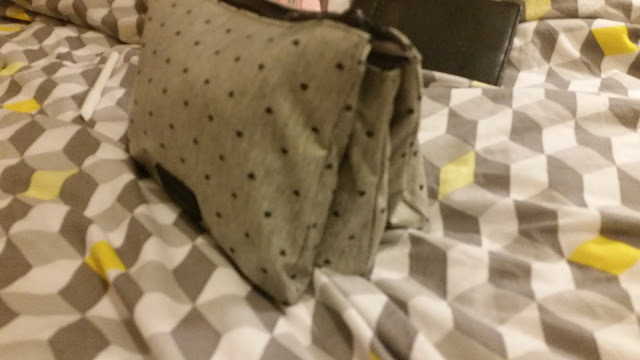 I can't remember the brand or anything but will update once I find it. I've been using it for a few weeks on and off and I'm not sure if I can see any difference but I haven't been using it consistently so I've pulled it out to use it. 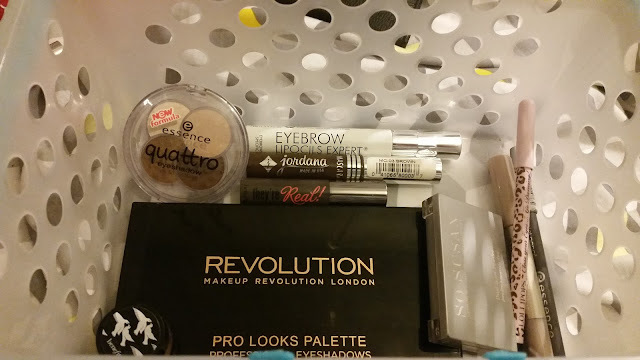 Jordana Brown Mascara - I find brown mascara dries out really quickly and as I've opened this when it arrived a couple of weeks ago I've decided it needs to be used. Benefit They're Real - As I was putting this basket together I was watching Kristen Gham's video where she mentions for her next use up mascara she's going to be using her sample size, This is my only sample size and I thought it was fate. Benfit RSVP - This is in my use 8 by bonfire as well. I do like this but I'm getting a bit bored of it and do keep ignoring it. I will use it this week. 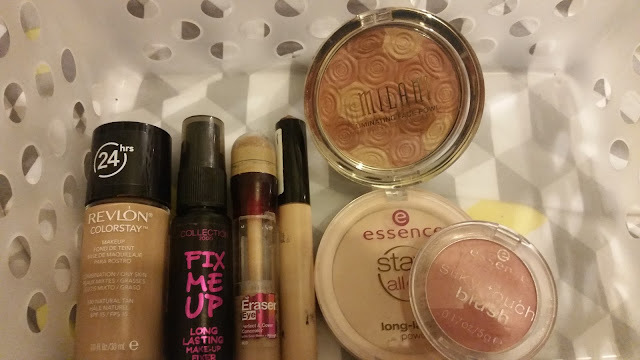 So Susan Eyebrow kit - I doubt I'll use this but I couldn't find the Essence eyebrow pencil which I have now found so this will probably come out of this weeks basket. Essence Stays eyepencil and shadow - 07 whipped white frosting - I've got a few of these pencil and I have previously used the bronze one as an eyes shadow base but it might be a bit too white. Essence Long Lasting Eye Pencil - My trusty pencil of life. I'm determined to have a week off this eyeliner. As much as I'm determined to get it finished by November i've used it so much I'm getting bored. Lollypops Eyeliner 701 Goodbye Moon - I haven't worn black eyeliner in weeks, I used to really doslike wind up eyeliners but as I love the Essence brown so much I'm trying to try some of my stash without going out buying any more. Essence Grey Kajal Pencil - This used to be a favourite and I wanted to include a normal pencil incase I don't get on with the black eyeliner. Hello Kitty Make Up Bag from Womans Secret - One of my greatest pleasures on holiday is buying a new make up back from Womans Secret when I go on Holiday. 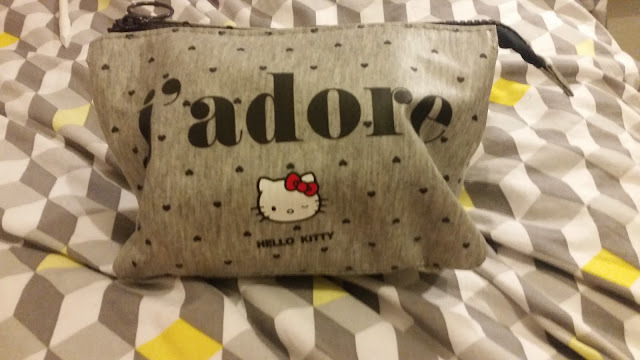 I've had loads over then last few years and they are always super cute and so much better than any make up bag I've had from the UK.